We have been having a bit of winter sun recently here in the UK, and it’s has been brilliant! I have therefore been heading out into the woods to play. With all the trails running so well, I thought I’d show you my 5… or 6 (as I got carried away with the conditions) favourite trails to ride in Wharncliffe Woods. There is a big mix of trails, with flowy berm tracks, to steep rocky descents, to really technical and challenging terrain. Give it a watch and let us know what your favourite trails are! Keep it rubber side down and get in contact if you want to progress your riding to the next level. The product felt great out the box, but I got a few issues I did not expect! We at ALine Mountain Bike Coaching are mountain bikers through and through. We often therefore like to test out bits and bobs cycling related. The theme of 2019 so far... gadgets. 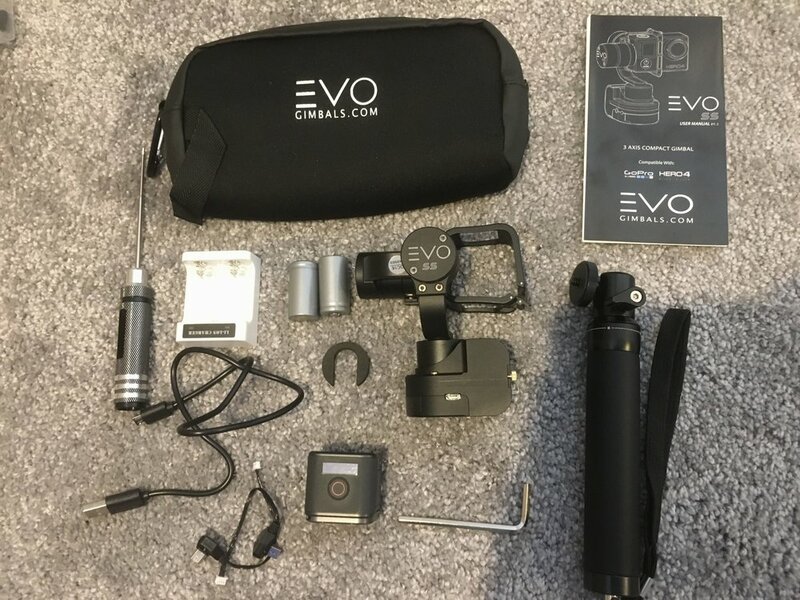 This time we are giving a first ride and impression of the Evo SS Gimbal. A gimbal is supposed to smoothen out Point Of View (POV) footage on your Go-Pro or action sports camera. The Evo SS is designed for a chest mount design. The product as a whole felt great out the box, but unfortunately a few issues have arisen that I did not expect. When opening the box, everything is presented nicely and in a neat fashion, and the gimbal comes with some good accessories as standard. Charging, mounting and setting up the gimbal in the house was easy. On my first ride using the gimbal however, I encountered a few issues. Firstly, when I tried to switch it on, it wouldn’t start, despite checking the batteries were installed correctly and were fully charged. Eventually, with a bit of fiddling about it started working and it seemed to work well. I put this start up issue down to user error. I captured much of my first ride in the video below. On the first run, the gimbal worked great, I was delighted with the results, in the knowledge that with a few setting tweaks, I could get the footage I was after. On the second, third, fourth run however, the gimbal was playing up. Watching the footage back, going round corners fast and harsh’ish impacts seemed to switch the gimbal off so the Go Pro was still working but just flapping around. This was frustrating. Next the batteries died on me after about an hour and a bit of use, which was not the 2-3 hour usage reported. When getting home I spoke to Evo about my experience and they think I had a battery issue. They are sending through some new batteries to see if this resolves the problem. I’ll keep you posted to see if it solves the problem. So, first impressions are that I need to test a bit more. I never judge things based on one use, as sometimes theres a bit of user error, and sometimes you are just the odd unlucky customer that has a faulty product (in this case, batteries). I will post up soon with how I get on. Keep it rubber side down. As the nights draw in and trails get wetter and muddier, although the latter often brings a smile to my face, it does get a bit old spending most of your time cleaning our kit. So, during winter I often gravitate towards the skate parks. They are a great place to hone your skills, keep dry, and expand your comfort zones. Join me in the video below as I go around Adrenaline Alley, in Corby, one of the best skateparks in the UK. Let us know how you get on and if going to skate parks helps your trail riding. Our 7th Top Tip for 2018 is in go slow to go fast! I know what you are thinking, this sounds like an oxymoron? How can going slow actually make you go faster? Read on to see how. Making a conscious effort to ride a bit slower is something ALine talks about a lot on our coaching days. The reason behind this is that on most rides we like to find our limit, or get close to it, as this is when we feel alive on the bike and we get that rush of endorphins that keeps us coming back for more. However when we are at our limit, we typically plateau in our riding speed and we go into a semi survival mode – this often means technique can take a bit of a back seat. Instead, I challenge you to on the next few rides, actively try to ride a bit slower, say 60/70% of your normal riding speed and really concentrate on the technique and skill required to ride the trail features. This way you are allowing your brain to put technique back in the centre of focus, allowing you to slowly expand your comfort zone down a trail. You will find that with practice your new limit, or baseline speed, will be faster. This is a technique I always employ when riding. I try to on the first couple of runs (and sometimes on my last one too), just concentrate on technique and remove a bit of speed from my riding. This gets my brain switched on to focusing on technique. This way, when I open the taps, that technique is better embedded as an automatic process. Let ALine know what you think and your experiences with going slow to go fast. Have fun out there and keep it rubber side down. Everybody wants to improve their riding, and ‘Go Faster’ is a term we often hear. ‘Going Faster’ is however an outcome and not a tangible thing we can just buy off the shelf. Instead of focusing on this outcome, we need to shift our focus onto the behaviours (controllable’s) that will result in the outcome we are after. As many of you may know, Gareth – UK ALine Mountain Bike Coaching manager, also works as a Mental Performance Coach, assisting athletes to better improve their overall performance through targeting mental processes and PST – ‘Psychological Skills Training’. Something we do a lot at ALine, is merge the two worlds of MTB skills training, and mental skills training, together. Today’s Top Tip is about just that, merging mental process’ with identified skills training. Within sport psychology we often refer to the 4 C’s of performance. They are, Commitment, Confidence, Concentration, and Control (emotional and physical). Referring to each of these four areas and asking yourself… ‘what is my Confidence for X terrain’ will help you identify different areas you may need to work on in order to improve your performance and ‘Go Faster’. 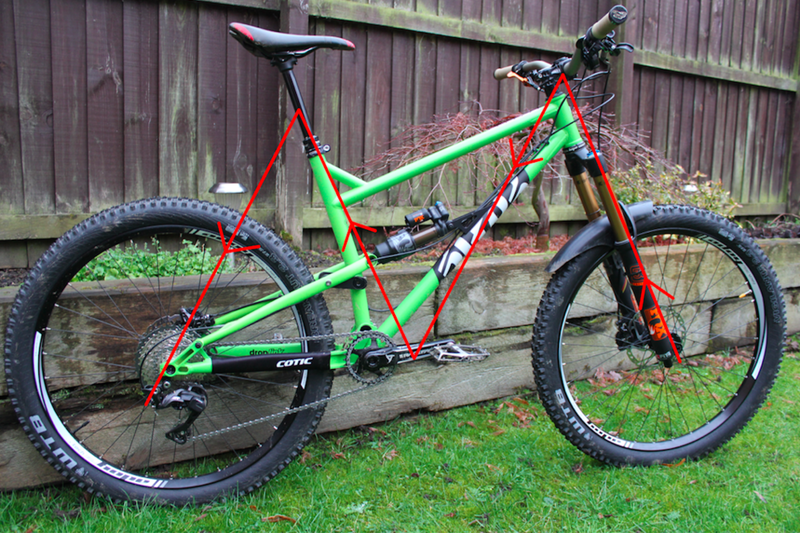 Control: 8/10 – I generally don’t panic on steep terrain and am able to keep in control of the bike. We have now identified one or two areas we could see a lot of improvement in, namely Confidence and Concentration. Looking at confidence, we can now begin to break down what being confident on steep sections looks like and importantly, what you need to do in order to gain confidence here, e.g. build more experience and ride steep tracks more often, learning the coaching points for riding steep terrain etc etc. This will lead to directed practice. Devise a plan to improve each of these areas for each skill – they are likely connected. If you are unsure of how to improve any of the areas identified above, please get in touch with ALine, as there is a lot we can do to help you improve your riding and enjoy the journey of progression. Cornering is arguably one of the most important skills to learn on a bike. Unbeknown to many, the cornering skill lends itself to a lot of other bike related skills such as jumping. 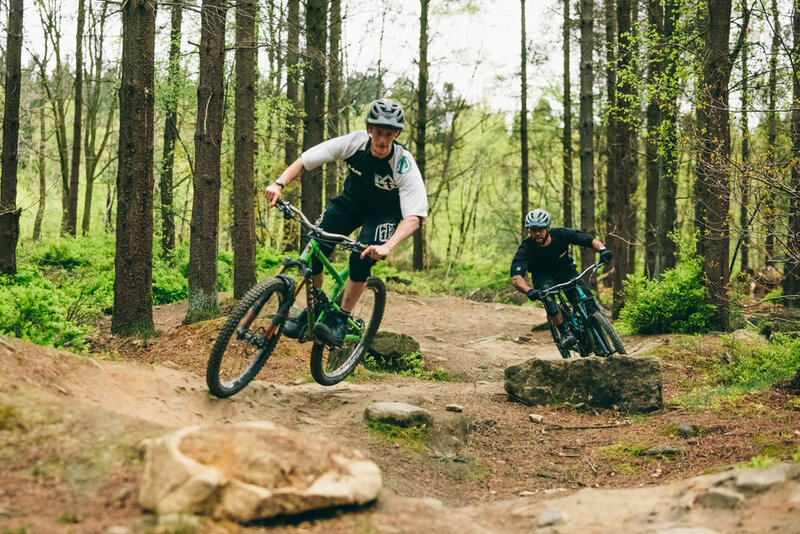 At one end of the scale, improving your cornering technique opens up many trails by unlocking confidence and skills to approach a trail with, whilst also improving trail flow. There are often features, such as a jump or a drop, that have corners either just before, or just after them. So the better at cornering you are, the more composed you are likely to be when handling other trail features. At the other end of the scale, racing for those vital split seconds, it is often thought that races are won and lost in corners, as they link sections together, enable you to carry (or not carry) speed down the trail. ALines Top Tip this month is to find a grassy field, preferably with a bit of a decline, and practice some cornering. Grassy banks are a great tool because a) there is no berm for support so you need to use lots of cornering technique, b) you can really lean on your tyres and test the boundaries of your technique and grip without rocks or hard pack group surrounding you. If you would like to learn how to really push your cornering technique, then our Flow course is ideal. If you would like to first understand the underpinnings of a fantastic foundation from with to build from, then our Fundamentals Course is for you. Please visit our site (link below) for further details. This months ALine top tips is a simple one but a key one. It is something we notice many riders not doing and it has a big impact on your control and thus confidence on the bike. It comes back down to your posture on the bike. We at ALine work with clients a lot on this as it is such an important part of improving your riding - you need to build from the bottom up to get the most from your progression, and your body position on the bike is a great starting point. Todays top tip is your knee position. A lot of riders, especially when feeling nervous, ride with their knees almost pinching their top tube of the bike. The result of this means that you feel less balanced on the bike and less stable, which has a knock on impact to your confidence going down the trail. Instead, open your knees, as a very rough guide, aim to get your knee's pointing towards your handlebar grips (on an MTB). This will do two things. Firstly it widens the platform you are balancing on, and secondly, and perhaps more importantly, it gives the bike room to move! When you ride with your knee close together the bike moves around on the trail, this results in increased body movement, which is not good as it unnerves the rider. By widening your knee position, the bike can all of a sudden move around between your legs, minimising (key work) the influence the trail is having on your body/head movement. This will result in feeling more stable and controlled down the trail, which will produce the by product of feeling more confident whilst going down the trail. Look at the picture of ALine coach Anthony. Coming through this section of trail his knees are wide, giving the bike room to move underneath him, minimising any impact on his trunk and head. Give it a go and let us know how you get on. If you would like to find out more, please get in touch, there is so many vast improvements you can make by just simply improving your body posture on the bike. Keep it rubber side down and see you on the trails. This months ALine Top Tips is a simple one but one of the most important articles to date! We coach a lot of people here at ALine and we undoubtably start each session with a quick bike check... You would be amazed at what we find in this 5 minutes, even on new bikes! Some example include very loose spokes, pivot bolts half hanging out, loose headsets, missing brake bolts, snapped pedal axles - all of these things have the potential to negatively impact your ride, and potentially cause injury to yourself too. The M Check is a great systematic way to work through the bike that just takes a couple of minutes and a few allen keys. In the long run this can save your body and your wallet! As you can see from the picture, it is called the 'M check' because we work through the bike in a rough M shape, starting at the front and working backwards through the bike. Follow these 5 quick themes to keep you rolling with confidence. Headset - this can be tricky: the best way is to pull the front brake lever turn the front wheel 90 degrees and gently rock backwards and forward. If you get any 'play' it is likely your headset will need pinching up (if you are unsure of how to do this, please seek professional advice). Check your cranks are done up tight by wobbling gently side to side. If they are tight, but you have play, it is likely your bottom bracket needs replacing, again seek professional advice is necessary. Check spoke tension - again you are looking for an even tension throughout the rear wheel. The rear wheel often takes a bit more of a hammering, so this is something that should be checked regularly as the odd loose spoke is common. Ensure the rear cassette is securely done up, gently wobble the biggest ring left and right, you shouldn't feel any play. If you do, this is a bit more of a specialist tool/fix, so consult a professional to get it sorted if you do not have the tools yourself. Finally, check the rear mech is securely fastened. This often comes loose due to vibrations and can go into the rear spokes if not fastened up regularly, so check this often. This may look like a lot, but essentially it is 5 quick, easy steps to keep you rolling, a smile on your face, and you money in your wallet. If any of you have any questions on this, or any of the other ALine top tips, please do not hesitate to get in contact. We are more than happy to answer any questions. Mountain biking is more than a sport or hobby for many of us, often being more of a lifestyle choice. The rush of flowing down a new trail, the thrill of opening it up a little more down a trail we know well, or the rush of endorphins that surge through our brains every time we hit the trails. This rush is why many of us love mountain biking, and although this euphoric state and high concentration helps us progress and keeps us motivated to push, to go out even in the most miserable of days, it can also have its downsides. One of those is that every time we go out on our bikes, we end up searching for this excitement and feeling of flow. This results in us rarely going past the point of analysis; meaning at the end of each run, we either pay no attention to any analysis, or do very little thinking about what we just did, and instead, just crack on back up the hill to the next trail. However, if you think of any other sport, more commonly conventional sports, athletes go to regular training sessions where they spend a lot of time, energy, and focus, on improving the specific movement patterns and technique that make up 'the how' of riding a trail, or drills that widen ones comfort zones for specific skills. In mountain biking we are very poor at doing this in general. ALine would therefore like to challenge you to think more about training rides, and how you can fit training into your riding routine. This looks different for each rider in its practical application. For example, some riders like to spend the first half of every ride as a training ride, others do it once a week or once a month depending on how often they ride. What we do know however, is that by increasing the frequency and implementation of training rides into your regime, it is likely to massively increase your rate of progression over time. The content and how you structure a training ride varies, but think about the underlying skills such as manuals, slow speed balance, and bunny hops to name a few. Then isolating specific areas of a track where you can begin to implement those skills. Finally, how to put that all together in a run or between multiple features in a trail. If you would like to find out more about how to better improve and structure a training ride, or the particular drills you should be doing to improve a specific area of your riding, please get in touch. 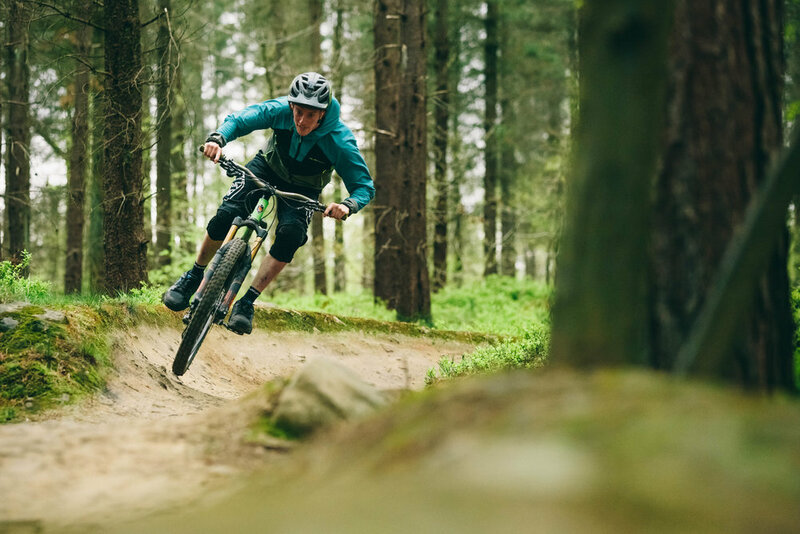 ALine has some fantastic courses that do exactly that, from fundamental building blocks and movement patters that underpin much of what we do on a bike, to flowing down a trail in an effortless fashion, to managing technical and steep terrain with fluidity and commitment. I look forward to hearing from many of you in the future. ALine wishes you a great festive period and new year. We hope this helps. Keep it rubber side down, enjoy the ride, and see you next time. Before thinking about getting out on the trail and improving your skills, there is a lot you can do with getting your set up right. We all know bikes can be expensive, but there are some relatively inexpensive ways to really improve your experience on a trail and to make the most out of your ride. You have six main contact points, four between the bike and yourself, and two between the bike and the trail. You can see a big benefit from making sure all of these are optimised. 1. Grips. By keeping up to date with replacing your handlebar grips, making sure they have plenty of life left in them can help your hands feel comfy, help to reduce arm pump, and inspire confidence. Grips can often be forgotten about, but by keeping up to date on maintenance of these will go a long way! Also, it is worth trying out some friends grips, what do you like, not like. Now a days you can get different lengths and widths of grips, let a lone the many different styles. 2. Flat Pedals. Everyone needs to give flat pedals a go. If you are normally a clipped in rider, give flat pedals a go! This will improve your overall control of the bike, making you more of a driver, rather than a passenger on the bike. I myself ride clips, however regularly change between the two as they both have their pro's and cons, being good on both makes you a more all round rider. If you are already a flat pedal advocate, great! However, I have seen many people who's flat pedals were probably not up to standard or were due for being replaced through missing pins. Two main points: Firstly, when a flat pedal has lots some of its pins or they have warn down it is probably time to renew. Secondly, there is a huge selection, ensuring that the pedal platforms are a sufficient size will really help with leg fatigue during a ride, and maintenance of grip and stability on the pedals. If you have big feet, make sure you go for a big platform. 3. Tyres. The final contact points are your tyres on the trail. We see it quite often where people's tyres have perhaps seen better days. Ensuring your tyres have plenty of life in them will help so much to get the most out of your rides. A tyre with little tread can make the bike feel twitchy, this then transfers into riding tight. Riding a tyre with good life will maximise your grip on the trail, which can then in turn translate into confidence on the trail - again leading you to be a driver and not a passenger on the bike. A lot of manufacturers now a days make great tyres, whether it be dry, wet, or a great all rounder.. Thanks for reading the first of ALine Mountain Bike Coaching's monthly top tips.